1. Popeye the Sailorman - First appeared in 1929. Made an appearance in 1933 in Betty Boop. Famous for eating spinach to get strong to beat the antagonist Bluto. He was sweet on Olive Oil, and somehow, there was a baby (not theirs) named Sweet Pea. Wimpy was a friend with a "thing" for hamburgers. Catch phrase, "I'll gladly pay you Tuesday for a hamburger today." 2. The Pink Panther - One of my favorites. There was no dislogue, yet it had a captive audience! He was created in 1963 and made his first television appearance in 1969. 3. Woody the Woodpecker - Woody first appeared in an Andy Panda cartoon in 1940. His laugh, both amusing and annoying, was his trademark. His first TV show was in 1957. 4. Speedy Gonzalez - He was the "fastest mouse in all of Mexico." He first appeared on TV in 1953. 5. 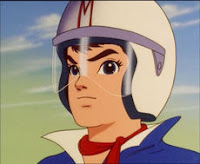 Speed Racer - The original anime' - directly from Japan with voice overs dubbed in English. He had a girlfriend, Trixie, a brother, Sprittle, who had a pet monkey, Chim Chim. His antagonist was the mysterious Racer X. His car was the Mach 5. Speed Racer was on television in 1967. 6. The Road Runner - This cartoon, set in the American southwest, pitted the Road Runner (beep! beep!) against Wile E. Coyote. They've been going at it since 1949. Coyote will never win! 7. 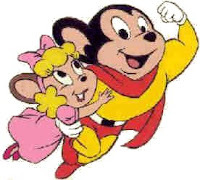 Mighty Mouse - Superpowers meet opera! This cartoon debuted in 1942. His catch phrase was sung, "Here I Come to Save the Day!" 8. 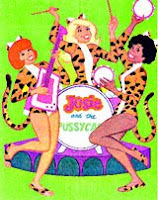 Josey and the Pussycats - This was created in 1963 and had its first television appearance in 1970. Much like scooby doo, they solved mysteries, but did so while rocking and rolling. It was a spinoff of the Archie series. 9. Heckle and Jeckle - I saw this playing on a little girl's TV in a movie recently, and I think it was Kill Bill II, of all things! 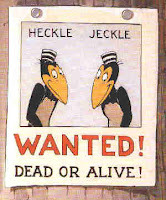 Heckle and Jeckle were talking twin magpies who debuted in 1946. 10. George of the Jungle - "Watch out for that tree!!!!!!!!!!!!!" George was not very bright. He thought his elephant, Shep, was a dog. His female companion was Ursula. He was on TV in 1967 and there were only 17 episodes made of this cartoon. 11. 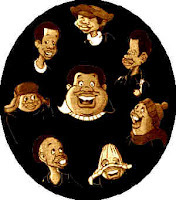 Fat Albert and the Cosby Kids - This was one of my other favorites. This came to TV in 1972 with Bill Cosby voicing four of the characters including the title character. "We'll have some fun here, with me and all the gang, learning with each-other, while we do are thing. Nah, nah, nah, gonna have a good time. Hey! Hey! Hey!" 12. Casper - "Casper the friendly ghost, the friendliest ghost you know..." He was created in 1945. He first appeared on TV in 1959. I used to love watching Casper on Saturday mornings. 13. Baby Huey - He was none too bright, this poor huge duck! He was created in 1949 and began appearing on television in the early 50's. I remember Popeye from my own childhood. Some of those cartoon would be considered so un-PC today! I remember people using Popeye as a reason I should eat my spinach, but I always pointed out that Popeye only ate it when he really had to! baby huey was a fave when I was really really little and I have to say you are the first to rmember heckle and jeckle, even my sisters claim not to! They were sitting right next to me! As for speed racer, I still have him on my office wall. One day he will knock on my door and say - marry me dallas! and we'll SPEEEEEED away to drive fast ever after! Aww, I remember all of those except for the last one! I love(d) Casper, he's so adorable...and we used to watch Woody the Woodpecker every day in Kindergarten...hehe! George, George, George of the jungle! Watch out for that treeee! LOL Now I'm going to have that song in my head all night. Fun list! Happy T13! These don't strike me as obscure. I've seen every single one! Happy TT. I'm talking about Water Creatures on books. oh good one!! brings back lots and lots of memories! I haven't thought about some of these in years! Josie & the Pussycats was my favorite! That brings up souvenirs ! I know them all except "Fat Albert and the Cosby Kids"which probably hadn't been translated. I have read them in German at that time I didn't speak any english ! I am familiar with every one of these - although the 'newer' ones came out when I was in college so I didn't see as much of them. I was exposed to them through my brother who started kindergarten the same year I started college. 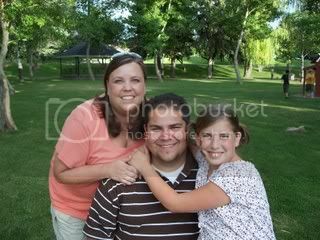 lol You have taken me on a wonderful trip down memory lane. I think Mighty Mouse has to qualify as my favorite. I loved his "Here I come to save the day." Awesome TT, I love the classic cartoons. Hi, I know I'm dating myself, but I remember all of them! Especially enjoyed Cosby kids, and of course, Road runner/Bugs Bunny! We must be close in age, I was waiting for the obscure ones... =) I remember all those... and Simba, the White Lion. I knew them all. What does that say about me? OLD!!!! I haved watched ALL of these shows at some point in my life! This was a really cute idea.